Making its debut at the Aira Residence gallery this afternoon was a one-off Range Rover customised by world-renown designer Piet Boon. The Dutchman was one of the creative minds involved in designing the interiors of the upscale condominium on Jalan Batai, and was at hand to unveil the special off-roader today. Automotive enthusiasts may be unfamiliar with the name, but this isn’t Boon’s first time working on a Land Rover – his studio has been collaborating with the company’s Netherlands branch since 2006. Among the vehicles he’s put his touch on include Range Rover Sports and Evoques and even one of the last Defenders ever made, the latter aptly named Last Defender. Boon’s creations can be a touch eccentric, but his latest is decidedly more subtle. Apparently inspired by the 1967 Ford Mustang Shelby GT500 Super Snake, this Range Rover features a murdered-out all-black look – the body, wheels and all the usual chrome trim have been slathered in ebony, while twin matte stripes provide a sporty appearance. The interior is trimmed in black and white leather. These additions are on top of a standard Range Rover Supercharged, powered by a 5.0 litre supercharged V8 that kicks out 510 PS between 6,000 and 6,500 rpm, as well as 625 Nm from 2,500 to 5,500 rpm; an eight-speed automatic transmission sends power to all four wheels, enabling the 2,336 kg behemoth to sprint to 100 km/h in just 5.4 seconds, before hitting an electronically-limited 250 km/h top speed. The price of all this is RM1.29 million, RM70,000 more expensive than the regular RR Supercharged. That’s a lot for some new paint, but how many Range Rovers out there have a designer (literally) brand plastered on the split tailgate? greeenapple, that’s a jolly good one. BTW, how do you know he owns a Kap-Chai ?! The name itself not nice sounding , pek boon , you drive what ah , pek boon Lange lovel, ? u called that special creative design? 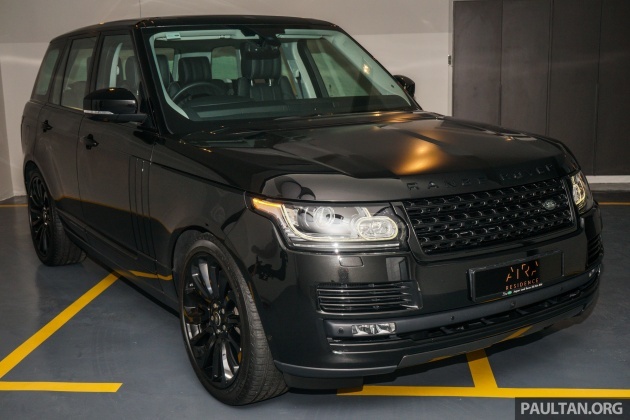 OMFG it just all black for extra rm70,000, nothing special and the worse is it’s ugly. if like that all the single coloured car out there are special designer edition. the designer himself looks bad too. aira? this must be joking. don’t destroy Land Rover please. It looks more like Show-off than one-off. after 5 years the value will be zero and probably u gotta pay someone to buy it..